Phew! The 2018 Auto Expo was massive and there were a lot interesting cars and bikes on display. We covered the mega, biennial event from end to end to bring you the latest automobiles. There were new car and new bike launches, concept cars, electric cars, electric motorcycles and a lot more. We give you details about everything you need to know about Auto Expo 2018. The all-new Swift was launched at a starting price of Rs 4.99 lakh. This is the all-new third generation Swift from Suzuki that broke cover internationally last year before finally making its way to Indian shores at the Auto Expo. Apart from an all-new design the Swift is also bigger in size now - overall length may have been reduced by 10mm now but the car is 40mm wider than the outgoing version which results in additional cabin space for occupants as also a larger boot for luggage, as boot volume is up by 58 litres. Maruti Suzuki India says the Concept Future-S is designed to reduce traffic congestion in India. The highlights will be design, head room, ride height and a commanding driving position. The e-Survivor previews a four-wheel drive, electric SUV. It has four electric motors, one at each wheel and a spherical display for viewing traffic updates, navigation and a host of other information. The all-new Amaze is based on a new platform that offers a little more space despite measuring under four metres. The styling is fresh and so are the interiors. Should the Maruti Suzuki Dzire worry? The 10th generation Honda Civic is showcased and will go on sale in India soon . It is Honda's largest selling model across the world. It looks sharp and modern and Honda says the interior reflects the same design language. The new CR-V will also make it here and the highlight is the availability of a diesel engine with the new CR-V. The Sports EV Concept is a two-seater sportscar, and was the showstopper at Honda's stall at the 2017 Tokyo Motor Show. Unveiled by Takahiro Hachigo at Tokyo, CEO, Honda Motor Company, the Honda Sports EV Concept is a retro looking all-electric sportscar that uses the same dedicated EV platform as the Urban EV Concept. With the Sports EV Concept, Honda has assured us that the change to greener tech will not mean the end of striking-looking automobiles. The Yaris is Toyota's answer to the Hyundai Verna and the Honda City. It is available with a 1.5-litre petrol engine, for now. There are seven airbags as standard. The Mahindra TUV Stinger is a drop-top SUV with the underpinnings of the Mahindra TUV300. However, M&M has not shared any other specifications for the Mahindra Stinger at the Auto Expo. Mahindra and Mahindra has been teasing about an all-new premium SUV on their social channels. And now the company has showcased the new flagship SUV at the 2018 Auto Expo. The Indian automobile manufacturer has clearly mentioned that the new SUV will be a rebranded version of the G4 Rexton sold in the international markets. The all-new Mahindra SUV as not been named yet. Tata Motors has taken the wraps off the the H5X. The radical concept previews a new SUV that is set to join Tata Motors' line-up this year. The production version of the SUV will be the first Tata product to carry the new Impact Design 2.0 design language. The 45X previews Tata's upcoming hatchback. It is based on a completely new platform and will take on the likes of the Hyundai i20 and Maruti Suzuki Baleno. The Racemo is a two-seater sports car built on a wholly new modular platform called MOFlex MMS that could in the future also spawn hatchbacks, sedans and SUVs. It was unveiled at the Geneva Motor Show 2017. Not too many sports cars come under 4 metres in length and especially ones with just a 1.2-litre Revotron engine thats mounted mid-ship! The car is at the top of Mercedes-Benz's line of luxury cars and features a long wheelbase, handcrafted cabin and a host of other exclusive features. The Mercedes-Maybach S 650 is powered by a handbuilt, 6-litre, V12, biturbo motor. The motor produces 630PS and 1,000Nm. The Electric Concept is the company's visionof what its future, all-electric SUV would looks like. The BMW i8 Roadster is the open-top convertible version of the BMW i8 coupe. The BMW i8 Roadster is a plug-in hybrid and its power train develops a combined out put of 374PS. The BMW 6 GT is the first GT car in the 6-series family and has been launched in India at Rs 58.9 lakh. The car features great cabin space, practicality and has been designed for long distance journeys. The new generation M5 has a V8 engine and gets AWD, a first in the history of the BMW M5. It can be converted to a rear-wheel drive in the push of a button. 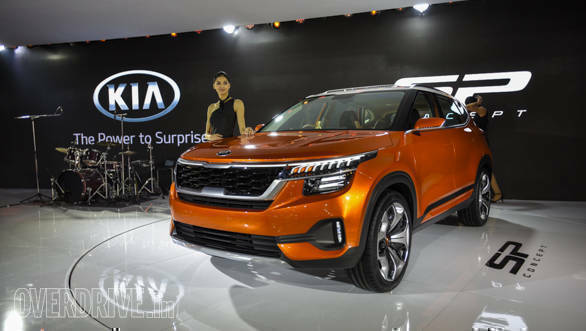 The Korean car makers displayed its entire range of vehicles but the most important is the SP concept SUV that previews the new SUV the KIA plans to launch in India. The Kia SP Concept has, as SUVs go, a Peter Schreyer-designed bold front appearance with a long bonnet. The bold and sleek exterior design is matched to a sleek interior which Kia says "marries an advanced sensual style and dynamic sensibility at its core with a differentiated layout that enhances convenience." 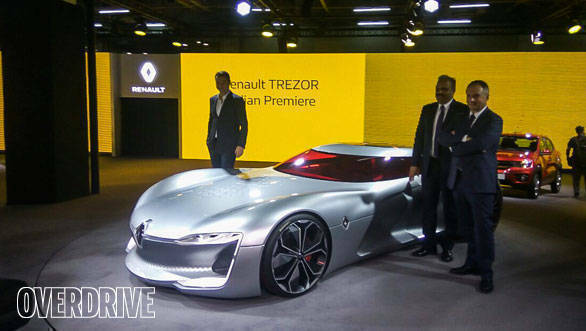 The Renault Trezor is a 2-seater electric sportscar concept that is powered by a Formula-e's 350PS motor. It basically previews the design and technological direction that Renault will be following in the coming years. 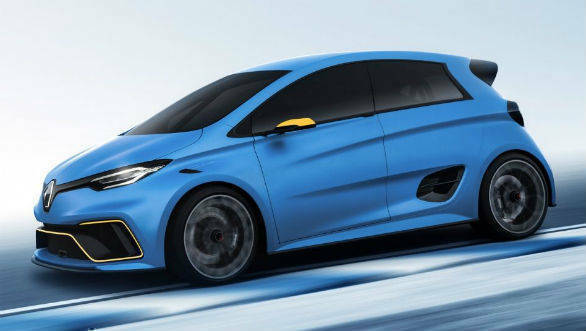 The Renault Zoe e-Sport Concept is a fully electric concept car that embodies Renault's commitment to the idea that electric cars can be fun and fast. The sporting credentials of the Renault Zoe e-Sport Concept extend beyond the car's styling and the same striking blue livery as the Renault e.dams team's front-running Formula E single-seaters. The new Elite i20 gets a few design tweaks to keep it relevant in today's times. the most noteable change is seen at the rear. The car gets new tail lamps and black, plastic inserts on the rear bumper. The Ioniq is Hyundai's answer to the demands of electric and hybrid cars. The car has a 104-hp petrol/diesel engine, a 43-hp electric motor. There were a number of motorcycle manufacturers that made a big splash at the Auto Expo 2018. There were a few launches as well and surprise launches as well some interesting unveils as well. BMW Motorrad has launched the F 750/850GS adventure motorcycles in India at Rs 12.2 lakh. Both the motorcycles are bring brought to the country via the CBU route. Read detailed story here. BMW Motorrad has confirmed that the G310 R and G 310 GS will go on sale in India around July-August 2018. The company says that there's only some amount of paperwork that's left and barring any delays, the bikes will be in showrooms during the aforementioned period. Read detailed story here. The all-new Kawasaki H2SX has arrived at the 2018 Auto Expo, price at Rs 21.8 lakh. The Kawasaki Ninja H2 SX is slightly based on the renowned H2 and will be a more affordable version of its supercharged twin. Also see the new Vulcan 650 S and the Versys X-300. The SR 125 slots below the SR150 and gets the same 125cc, motor that powers the Vespa 125. The styling remains identical to the SR150, save for new graphics and colours. The Storm is the adventure scooter variant of the SR125. It gets wider, dual-purpose tyres and big windscreen on the handlebar. Aprilia has not mentioned anything about changes to the suspension. Both motorcycles borrow styling from their RSV4 and Tuono V4 siblings, but under the skin is a new 150cc, liquid-cooled engine that develops over 18PS and 14Nm. The 17-inch wheels are equipped with a 300mm disc up front and a 218mm disc at the back. ABS is standard, and a quick shifter will be available as an accessory. Based on the Suzuki Access 125, the Burgman Street is a maxi scooter with features such as an extra-long seat, LED head and tail lamps and a large storage boot. A new middle-weight motorcycle from Suzuki is all set to take on the likes of the Kawasaki Z900. CKD manufacturing also means the price will be competitive. The 750cc, inline-four engine is regarded as one of the smoothest in the segment. The Honda X-Blade slots in between the Unicorn 160 and the Hornet 160R. It features new body work that looks pretty sharp and distinct. The fifth generation of India's most popular scooter broke cover at the Expo. It gets LED headlamps and a few styling tweaks. Honda has also displayed the 2018 Africa Twin, 2018 Goldwing, CBR 650F. Yamaha India's star attraction is the all-new, YZF-R15 v3. It has a 155cc, liquid-cooled, four-valve , single-cylinder engine that develops 19.3PS at 10,000rpm. It also gets Variable Valve Actuation (VVA). It is priced at Rs 1.25 lakh (ex-showroom). Yamha also launched the new YZF-R3 at the Auto Expo, which marks its re-appearance after it was withdrawn from the market once the BS-IV norms kicked in. The bike gets a new BS-IV motor, dual-channel ABS and Metzeler Interact M5 tyres. The X Pulse 200 is an adventure motorcycle that follows the Hero Impulse. Built to tackle any terrain, the X Pulse 200 features 190mm front forks, 170mm gas-charged monoshock, 220mm ground clearance and a lot more. For Overdrive's complete coverage of the Auto Expo 2018 click here.